Every day, our board of directors and staff carry out the mission of the Foundation, dedicating themselves to building a healthier future for all Manitobans. Guided by a framework of trust and accountability, the board and executive management team work together to fundraise for St. Boniface Hospital and St. Boniface Hospital Albrechtsen Research Centre with excellence, transparency, and integrity. The Catholic Health Corporation of Manitoba (CHCM) sponsors and helps govern more than twenty ‘communities of service’, of which St. Boniface Hospital is one. 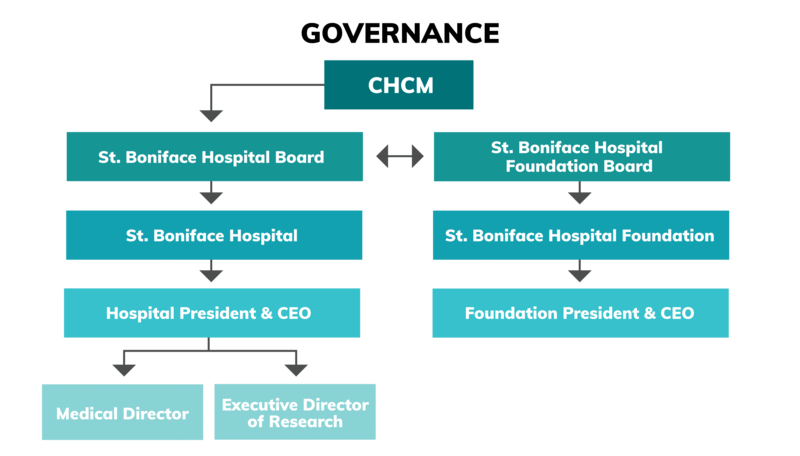 Learn more about CHCM’s role in governing the Hospital, Research Centre, and Foundation here. Our volunteer board members are highly respected members of our community who give their time and expertise to help guide the Foundation.